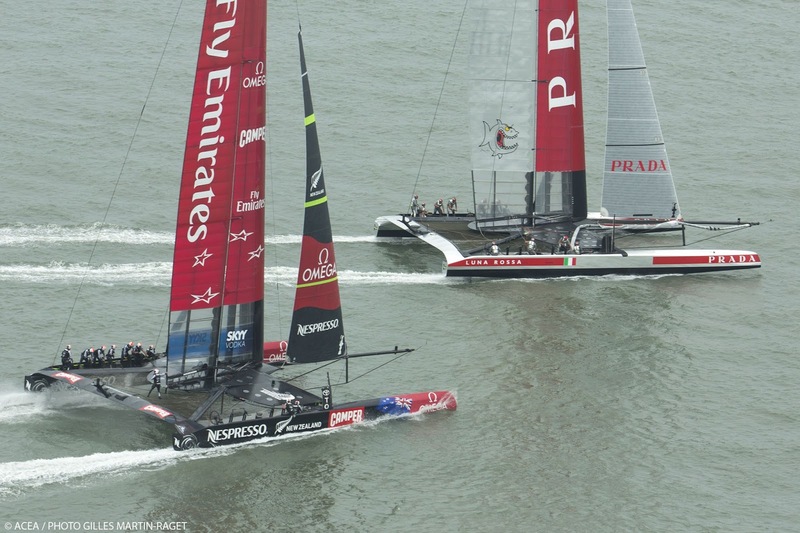 Emirates Team New Zealand has claimed the top spot in the Round Robin Series of the Louis Vuitton Cup, the America’s Cup Challenger Series. The Kiwi team, led by skipper Dean Barker, completed today’s 15.43-nautical-mile course in 46 minutes, 53 seconds and finished more than seven minutes ahead of Luna Rossa. The Italian team was scored DNF for failing to finish within five minutes. The Kiwis have amassed 7 points and have three races remaining in the challenger's series, but can’t be overcome. In winning the round robin they’ve earned the right to advance straight to the Louis Vuitton Cup Final or choose their opponent for the semifinal round. 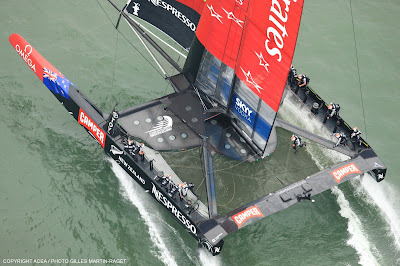 As yet, the team haven’t announced their intentions other than to say that they plan to sail their next scheduled races on Saturday and Sunday. 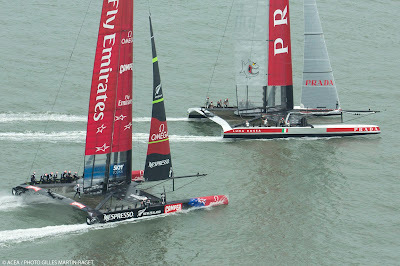 Luna Rossa had been closing the deficit with Emirates Team New Zealand. The Italians lost by nearly five and a half minutes in their first head-to-head meeting on July 13, but chopped three minutes off that deficit in Sunday’s race. Today, however, the Italians were badly off the pace, and grinder Giles Scott said that the crew was disappointed with the effort. 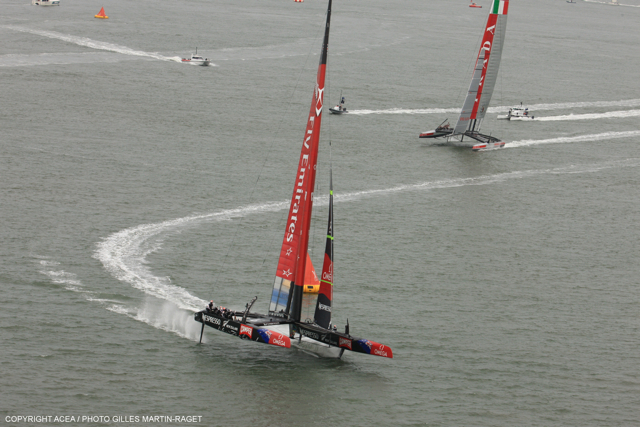 Luna Rossa suffered a pre-race mishap when the team’s AC72 was launched in low tide. The port side rudder hit the bottom and had to be removed and repaired before the team left the dock. Today’s race was over in the pre-start. Barker was able to position Aotearoa in front of Luna Rossa, which put the Italians in a tough position. Both teams were late to the start line, but the Kiwis had the advantage of position and entered the racecourse 15 seconds ahead of the Italians. Emirates Team New Zealand’s next race is on Saturday, when they’re scheduled to race Artemis Racing. Luna Rossa Challenge is scheduled to race again Thursday against Artemis Racing. 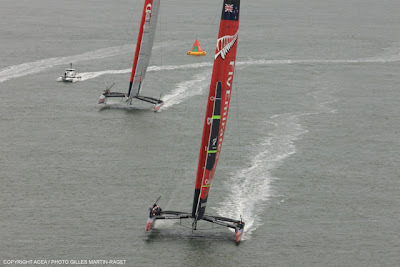 The Kiwis and Italians race again on Sunday.